and anxiety of getting and wearing dentures. ​Let’s get to it right away. ​Part 1 is here, if you need to refresh your memory. The dental world is a huge supermarket with all sorts of different brands ranging in size, price and quality. Many dentists have completely opposite ideas and philosophies on the kind of treatment their patient needs. This variation also impacts dentures, so where one dentist and lab technician can do an outstanding job, another office can do an awful one. However, one common characteristic of a good denture-making dental office is customer satisfaction. This aspect can’t be faked, therefore don’t be someone’s guinea pig but rather put your trust in a dentist who has already earned it. Our Las Vegas denture clinic has done it time and time again. The first set of dentures is primarily made for healing purposes, so that as your mouth goes through all the changes you have something to wear. In about 6 months, much will be different. Your bone level will recede, your gums will shrink. Your first denture won’t fit the same. Therefore, it is highly recommended to get a permanent set after the initial healing process. Additionally, you will have another chance to check the look and fit of the final denture. You don’t necessarily have to get a second set of fake teeth if you like the look of your original one. However, if you just want to stick to your first one, what you will need is a reline. Reline is a procedure that fills the voids in your denture with extra acrylic and makes it tight again. Loose dentures can cause a lot of insecurities and a lack of confidence when you speak in public or try to enjoy a meal. Since your gums will never stop changing, in order to avoid the frustration of loose dentures, it is recommended you get relines annually. Rather then constantly measuring yourself against the final destination, which could be depressing, measure your progress by each individual milestone you reach. Those might include: impressions, bite-registration, wax try-in, extractions, post-op, adjustment #1, adj. #2, adj. #3…adj. #9, soft reline, re-evaluation, hard reline, etc. Celebrate every step and take the time to be proud of these small victories, which when reflected upon, will add up and provide a lot of encouragement to continue. This point is essential when it comes to fighting anxiety for denture patients. Your support team are the people (or a person) who know you and have been with you through your entire denture journey. They have faithfully walked beside you when you first decided to get dentures, and they are the people that will offer emotional and mental support when you are struggling. These are the people around which you are comfortable NOT wearing your dentures. I have seen the impact of a strong support system on a denture patient and can testify of the powerful effect it has against all the fears and potential anxieties. At the end of the day, if you have done the research, have mentally prepared yourself, and have a cheerleader or a cheer-team to support you, getting dentures will be awesome. I have seen tons of folks cry with joy when they see their new smile for the first time. I have seen even more come back and point out specific details they love about their new teeth. And I continue to see patients become 10 years younger right in front of my eyes, full of confidence and motivation to live their lives again. So, is the denture journey always filled with beautiful landmarks and majestic sights? No. But is the destination worth it in the end? Absolutely. And as always, if you are traveling in Las Vegas, NV and need a quick denture repair, reline, or a denture replacement, give us a call! As if the thought of going to the dentist wasn’t enough. As if actually doing so and allowing the dental assistant to take all the X-rays, the hygienist to poke your gums, and the dentist to examine one tooth at time wasn’t a big enough victory over your fears. ​Yet, you leave the dental office with another hard pill to swallow- a prescription for your dental issues that you probably didn’t even anticipate: full mouth extractions and dentures. After becoming a dental assistant and seeing first-hand all the anxiety patients go through, I was determined to do as much as I could on my part to minimize this choking, paralyzing fear, especially prevalent in denture patients. Shortly after working as an assistant, I decided to become the actual person responsible for making those same dentures I’m used to seeing cause anxiety. The following tips are the result of years of experience in the dental field in various roles, and will hopefully help you or someone you know to overcome the anxiety of getting dentures. They are written primarily for local patients looking for affordable dentures in Las Vegas, yet they are universal. I believe the key to overcoming this anxiety is a thorough understanding of the matter; an informed mind that guides emotions. Therefore, education is my primary goal here. Part 1 will cover the first 4 tips that are more foundational in nature, while Part 2 will focus on the remaining 6 tips which are more practical. ​If you absolutely don’t have to, that is. I have met many people who have seriously underestimated their abilities to handle dentures but chose this route anyway while still having other options open. If you can afford it, do crowns, bridges, implants or start with a partial denture, if that’s an option for you. Consider all of the above first, even if it’ll push the inevitable only a few years out. Let it be your last resort, so that when it gets tough you can tell that to yourself. There are many videos, communities and groups of people out there talking about individual denture experiences, difficulties, successes, etc. Educate yourself through people who are already doing what you are just thinking of doing. This will bridge the gap between your ideas and reality, theory and practice. And if you are in Las Vegas, NV feel free to stop by and have a talk with us. Our team of denture professionals would love to answer your most personal questions and give you an honest advice. There are many benefits to having dentures, like a beautiful smile, gained feeling of confidence, ability to chew hard foods again, but you also must know all the fine print, so to say. Approach the business of getting dentures like the business of signing a contract, where EVERY detail is essential to know. Some of the doctors I have worked with would almost seem to be talking the patient out of dentures with all of their “negative talk”. Yet, it was the best thing for the patient (and the doctor) in the end. The docs who sugarcoat the matter will end up ultimately hurting you since mental readiness is absolutely vital in order to uproot the first signs of anxiety. One of the most common misunderstandings about wearing dentures has to do with the lower denture. Upper dentures often get good suction, but even though the lower denture is the one that logically should be staying strong, it is the one that’s often referred to as a “floater”. Only a small percentage of lower dentures stay in place and don’t move, so your solution could include various adhesive products, or even better- implants, which would secure that sucker for good. It is truly a journey with its own milestones, valleys, high peaks and low grounds. You will have dreary days and joyful days; rough and easy. Thinking of getting used to your false teeth as a journey instead of a 100 meter sprint is mindset that will absolutely change your life. You won’t be surprised by all the obstacles, you will expect them. How long is the journey? Somewhere between 6 and 8 months. So throw on a backpack, get ready for all sorts of weather, set realistic short-term goals and don’t forget your favorite book. Soon enough you’ll reach Rome. If you are in Las Vegas and in need of affordable dentures or a denture repair, reach out to us and we would love to help you. ​Dentures are made out of various kinds of plastic, ranging in quality from low to medium, to high. ​This could result from a hard bite of your lower jaw, from the denture being too thin, or from simply dropping it on a hard floor while putting in on. The solution for the first two is to have a thicker denture or one that would include a metal cast in it for extra strength. When a tooth falls out of the denture it might be a sign of either a poorly made denture or an extra hard bite where that specific tooth is hitting against opposing teeth. The latter issue can be fixed by a dentist once the tooth is repaired. 1. Don’t panic or despair. Most of the time it is possible to repair your denture. 2. Don’t try to fix it yourself. Although the temptation is to simply find a quick solution and implement it, most of the time it will only hurt the possibility of fixing it correctly. 3. Don’t use super glue in any way, shape or form! This is important. Stay away from it. First, you might attach broken pieces incorrectly and it will make matters even worse. But even if you do attach the pieces correctly, super glue will hold them together only for a short while, and once your denture breaks again it will be impossible to repair it. 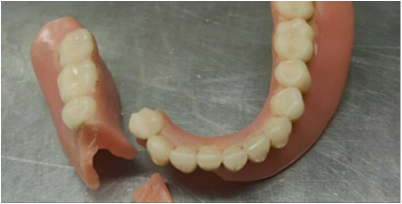 The breaking line should be clear and unobstructed by any foreign materials, otherwise it will be impossible to attach it exactly the way it should be, and a brand new denture might be the only solution left. 4. Don’t throw out the pieces. Otherwise the replacement pieces used during the repair might not look exactly the same as the original. 5. Don’t use unsafe objects. Like fake nails, white paint, or other plastic as a replacement for a missing or a broken tooth. These might hurt your health and cause intraoral allergies and burns. 6. Don’t continue wearing the denture that has a crack. ​ If you follow these simple steps, chances of successfully restoring your denture will rise drastically, so listen closer. 1. Pick up all the pieces and put them in a bag. Do so even if it’s still in one piece, but there is a crack. Simply stop using it and store it in a safe place. 2. Call a lab/dental office in your area and ask about the timeline as well as the price for your denture repair. 3. If satisfied, drop the denture off, and when picking up make sure the repair quality is satisfactory (shape, shade, fit). That’s it. Simple, yet only about 50% of patients follow these steps. Keep in mind that in some instances it is impossible to repair the denture due to the nature of the crack or missing, but essential, pieces. In those instances a reline might be necessary to completely replace those missing areas. In other instances, a complete remake will be the only solution. If those options don’t sound good to you or might be too difficult to afford at the time, visit other offices to get a second and a third opinion. Affordable denture repair is always the best solution, so if you have time on your hands, shop around until you are comfortable with your decision. We would love to be your first point of contact for your emergency denture repair, especially if you are just visiting Las Vegas and something unexpected happens to your denture. If are looking for fast, cheap and professional service, call us now at (702) 425-1515 !